Wharfedale travelled south last Saturday and were disrupted by problems on the M6. Hosts Stourbridge were, as expected, more generous than some clubs, and agreed to a delayed kick off. The home crowd and the faithful few that had made it were hoping for an open, attractive game of rugby. Both sides were also trying to play rugby to cheer the crowd but both sets of supporters were sometimes at a loss as to what was happening on the pitch. Dale played with a lot more heart and courage than shown in previous weeks and deserved some reward for their efforts. The home support commented on the commitment of the visitors and the way they played. One try apiece was scant reward for the players or the paying public, but Dale need to be proud of the way they played the game. There was the odd mistake in handling. There was the odd missed tackle but this was an improved performance with all players getting involved and giving 100%. Stourbridge had the better of the opening exchanges and it took Dale a few minutes to get into their stride. Stour opened up with a penalty by Luke White after four minutes and he converted Tatenda Mukarati’s try four minutes later. It was Dale from the match against Sheffield Tigers again but then after leaking 10 points the real Wharfedale turned up. Jamie Guy brought Dale on to the scoreboard with a penalty before White stretched Stour’s lead with two more penalty kicks. Wharfedale’s try came from an accurately placed left footed chip from Rob Baldwin, and, with confusion in the defence, Baldwin expertly got another foot to the ball, which the backs and forwards followed up and won a 5 metre scrum. The pack held the set piece, soon putting Will Lawn over in the corner. Guy missed from wide with the conversion but the score now read Stourbridge 16 Dale 8. History is littered with the “what if” and “if only” and the talk from the friendly Stourbridge support reflected this and were grateful for those early 10 points. That same support also commented that they had spent most of the second half looking at the end that the home side were defending. Dale were certainly giving it their all. The Stourbridge defence was solid and there was now no quarter being given by either side. Tackling was hard, the breakdown was spirited and both sides were putting their hearts and bodies into the fray. Up against another bigger set of eight the Dale forwards held their own, and the statistics on scrums and line outs only just showed an advantage to Stourbridge. Dale’s scrum was 80% with Stour at 86%. The Greens line out was 73% (with two mistakes coming early) with the Midlanders just ahead on 77% (this included two not straight efforts). The scrum count does not include the uncontested scrums. Dale lost three props to injury. After some confusion on the touch line the ref ran over and ruled that Dale were allowed a substitution. The only score of the hard fought second half was a penalty by White and Dale left with no bonus points but the admiration of the home supporters. There were a lot more positive developments from this game than in previous weeks. Yes, it was another defeat, but what an improvement. 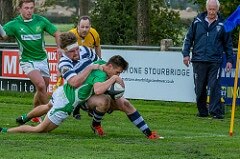 Stourbridge are a team in the top 5 of the table and the Wharfedale players commented on how hard they were made to work all through the game. The tackling, so berated in these columns in recent weeks, vastly improved. The returning Huw Morgan led the defence by example and by taking charge in certain situations. All the backs responded and were all involved in defence and showed a hunger in wanting to get involved. Nobody looked out of place and there was a lot to take into training and on to the pitch next week especially league debutant Ben Parkinson. The forwards were magnificent and matched Stourbridge blow for blow. Rob Baldwin had a tremendous game, only marginally spoilt by a technical yellow card for lying on the wrong side. This happened just after the last fit prop came off and briefly Dale were down to 13 men. The ref intervened and ruled that Wharfedale could send on a replacement. Wharfedale Scott Jordan; Ralph Wellock, Harry Bullough (Andrew Hodgson 75), Huw Morgan, Josh Prell (Ben Parkinson 75); Jamie Guy, Will Lawn; Joe Altham (Ian Larkin 36, Alistair Allen 66), Dan Stockdale, James Huck (Matthew Close 41, Joe Altham 48), Alistair Allen (Elliott Ward 59), George Hedgley, Rob Baldwin (c), Lewis Wilson, Josh Burridge.